DALLAS - Bailey Adam was running a half-marathon when she collapsed from sudden cardiac arrest. Her heart stopped and she had no pulse. 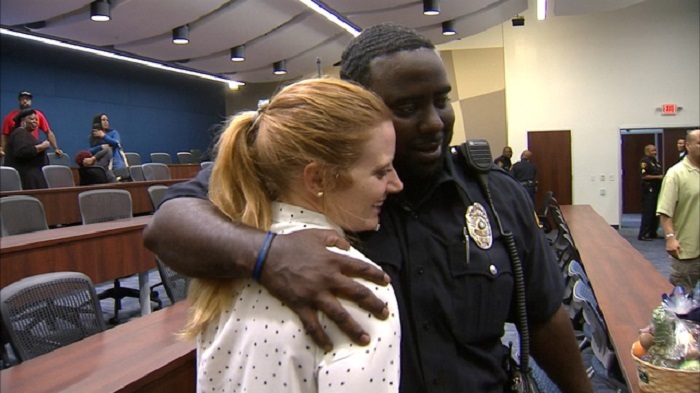 That day Bailey’s life was saved by three people: Dallas police officer Orintheus Buster and two nearby runners who happened to be doctors, Malissia Zapata and Esther Holloway. Bailey woke up three days later in the hospital after clinging to life. She had no memory of collapsing but knew that someone running the race stopped to help her and saved her life. For weeks, she didn’t know who they were. Bailey is extremely lucky. Doctors say that less than 8 percent of people survive sudden cardiac arrest like she did. But Bailey is doing well, and even got to meet some of the people who saved her: Officer Buster, and the paramedics who showed up soon after. Officer Buster says he was just glad he’d learned CPR as a teenage lifeguard. For now, Bailey’s still recovering, but she hopes to soon thank the two other doctors who worked to keep her alive.